Updates to John J. 's profile since your last visit are highlighted in yellow. What is your preferred delivery method for information about the reunion? John J. Rosborough posted a message. John J. Rosborough has a birthday today. 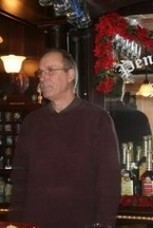 John J. Rosborough updated profile. View. John J. Rosborough added a photo to profile gallery. John J. Rosborough changed "Now" picture. John J. Rosborough has left an In Memory comment for Barbara S. Bradley. Very sad, way too young. I remember as a very beautiful and nice girl.